Completed about 1/3rd of the barn floor today; decided to do a small pour to allow everyone to get used to the process. Sean and Carlos haven't done a slab of this size before, and pouring concrete is a complicated dance. The first step isn't shown, where we screed the concrete -- get it to a rough level. To do that efficiently, you need three guys. One on either end of the board that is moved along the top of the forms, and a third guy with a shovel to move concrete in to fill in any dips or gaps that show up. Once the concrete is screed, you float it with a bull float to get the basic surface started. In these photos both of those steps have been completed. We're cutting expansion joints in every 8' along the slab, so it basically breaks the concrete into 8'x10' tiles. As it swells and shrinks due to heat or cold, the expansion joints allow space for it, and prevent cracks. Actually, it'll probably crack at the expansion joints. It's more correct to say it's going to crack, and the expansion joints direct that crack to a particular place. Once the joints have been cut in, we bull float it again to cover them up. The joint is still there; it's just covered with a thin layer. We do that so that if the slab doesn't crack it provides a smooth, crack-free surface to make cleaning easier in the future. cover the finished sections with plastic. We'll pour the center portion tomorrow, and the final 1/3rd we'll probably pour on Wednesday. Everything is closed on Monday. Good day today. Got a lot accomplished. Spent today doing the final tasks in preparation for pouring concrete tomorrow. Here Red tests the level. The plastic does two things; one, it prevents the concrete from drying too quickly, resulting in a stronger floor, and two it prevents the movement of liquids either up or down. The mesh is to provide reinforcement of the concrete when it's being pulled apart. Steel works well under tension, concrete works well under compression, and when you combine the two you get a much stronger, more durable slab. The mesh will prevent cracks from spreading, too. The total floor size is 80' x 30' -- we'll pour 8' x 80' of it tomorrow, which is about what a concrete truck will hold. That'll give the crew a chance to learn their jobs and practice a little. My brother Bryan and I have poured large slabs before, but none of the other people who will be working have, and there's technique that you have to learn and timing. Friday we'll pour the rest of the slab - 22' x 80', and it will be a long day. The 30-year old subsidy on corn ethanol has been cut from the latest budget, saving taxpayers around $6 billion a year. The total cost of the program is estimated at $45 billion dollars since 1980. I'm really glad to hear that. Food should be for eating, not for fuel. You'll find the orginal story here. "Burn down your cities and leave our farms, and your cities will spring up again as if by magic; but destroy our farms and the grass will grow in the streets of every city in the country." I think about this every time I wonder why we're so intent on flooding or destroying farmland in Western Washington. USDA organic: What does it really mean? I'm very interested in where my food comes from, and I'm very interested in how it gets produced. In fact, I'm so interested that I started farming mostly as a reaction to the anonymity of the food that most of the US consumers eat. But I'm pretty extreme -- not everyone starts their own farms to eat better. Most people who are concerned about animal welfare use the words on the packaged food to inform them about their food, and that's a good thing. Informed choice driving your purchases is how you can make a direct change to our food industry. One of the most widespread types of certification is that offered by the USDA, specifically the USDA Organic Certification process. Whatever the standards are, I think it's very important that people actually follow them. If you promise me that you're certified organic I, and every other customer of yours, have every reason to expect you to follow the guidelines and maintain the standards. The primary problem that I've had with the USDA Organic label is that they have had several instances where food producers have not followed the standards of production, the USDA has been put on notice that they have not, and it has taken YEARS in some cases for any action to be taken. Let me repeat: Known violations, claims that the products are organic, no consequence to the producers. Typically food that is labeled organic is sold at a higher price than food that is not, so there's actually an economic advantage to be had by labeling food that is produced non-organically as organic. This has shown up at farmers markets, for instance, where vendors have been buying conventionally produced produce and selling it as local, organic produce, and pocketing the difference. This was the case with an Oregon man, Harold Chase, who made more than $450,000 selling corn that he claimed was organic, which turned out to be conventionally raised corn. This corn was used to produce "organic" animal feed and products. That $450,000 he made was the markup that organic corn is given over conventional corn -- it's pure profit. When you can make that kind of money in a relatively low-profit business like farming, you'll see more of this. The economic incentive is just too big. Our food system is made up of a whole chain of people, and when any link on that chain is compromised it makes the efforts of everyone else worthless. Lets imagine that everything along the whole chain went right. The food was produced organically, it was correctly harvested, it was shipped and stored correctly, and it arrived into the back of your local supermarket in perfect shape. My single largest complaint about the USDA Organics program is that the enforcement of the rules and the investigation of the violations isn't effective enough to give me any confidence that the standards are being upheld at any point in the supply chain. The easiest place to start is going to be at farmers markets. I'd like you to take the time to ask the vendors about their farms and their practices -- specifically, if they're certified USDA organic. If you notice a vendor that seems a little vague about their product practices, talk to the manager at the market about your concerns, and take the time to report your concerns to the USDA. Yes, you may report people who are indeed organic, but it's also true that this sort of report is often the ONLY way that the violators are caught. Error on the side of caution. Expect that they follow the rules. Well, between the government agencies, employee issues and lawsuits, I get to do a little farming. This is the view from the end of the large greenhouse, doing its offseason job of providing livestock shelter. I'm doing a deep-litter type approach here -- there's about a foot of fresh wood chips under the pigs. There's one large feeder in with the pigs, and two outside the pen that we'll rotate in as its consumed. I run a panel across the greenhouse, and woven-wire fencing along the edges to keep the pigs off the plastic, and to keep any pigs that get out of the electric fence in the greenhouse. These little guys are small enough that they can slip under the electric fence setup we have, but I don't worry about them too much. They mostly snooze and hang around the extra feeders, and eventually will usually go back in with the main herd, but they're well-contained by the greenhouse and no bother to me, so I let them be. Here's the view from the middle of the greenhouse back towards the feeders. There's 75 or so pigs in this pen. I've set it up this way so that there's an alley for the tractor all the way along one side; makes it easier to bring in new chips or supplies as needed. Once the pigs have been on this side of the greenhouse for a while, I'll move the alley to the other size. At this time of year we have to deal with the automatic waterers freezing, and we do that by switching to smaller bowls of water. I don't use a trough here because of the varying sizes of pigs; the smaller ones have a hard time dealing with the height of the trough, but everyone can drink out of the bowls. They'll turn the bowls over and wet the wood chips, and this is where I'll need to add more chips, I note. the space is big enough that the pigs can spread out and have some alone time, or cuddle up. When they sleep like this I know that the bedding is warm enough that they don't feel the need to cuddle up; the wood chips compost and provide heat for the pigs, and the warmer and nicer the bedding, the less feed they consume to put on weight. Plus I like to see lazy, contented pigs snoozing and grumbling and basically having a nice winter day together. I've written before about my irritation at having some of my equipment and tools taken by an ex employee, and I thought that I'd post an update to the situation. We achieved personal service on Isaac Dozier tonight for a small court claim for the value of the tools and equipment, plus court costs and fees. Our first court date is set for January 23rd. I was present at the serving to identify Isaac for the process server. 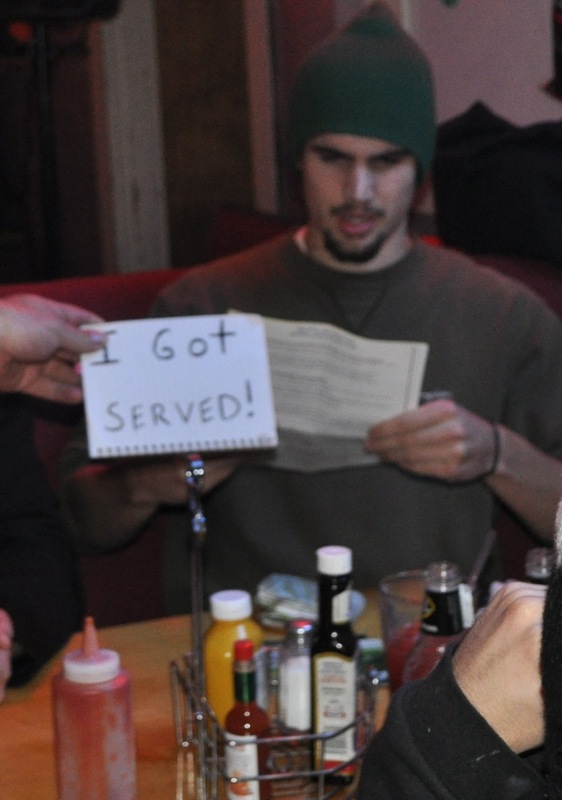 We found him having dinner with his friends at The Conway Pub. Which does have very good pan friend oysters, by the way. He seemed pretty surprised to see me and the process server, but that's OK. Merry Christmas, Isaac. I've asked him to return my equipment and tools via voicemail, email, US-Mail and in an in-person visit, where I saw my equipment in use by him. At this point it's a matter of principle. See you in court, Isaac. His friends weren't sure what was going on at first, but when they read the sign i was holding they got the idea. They started to laugh. Does this stuff happen to Isaac often? He spent the next 45 minutes explaining to his friends why he was being sued. Kinda put a damper on his get-together, but hey, you gotta do what you gotta do. 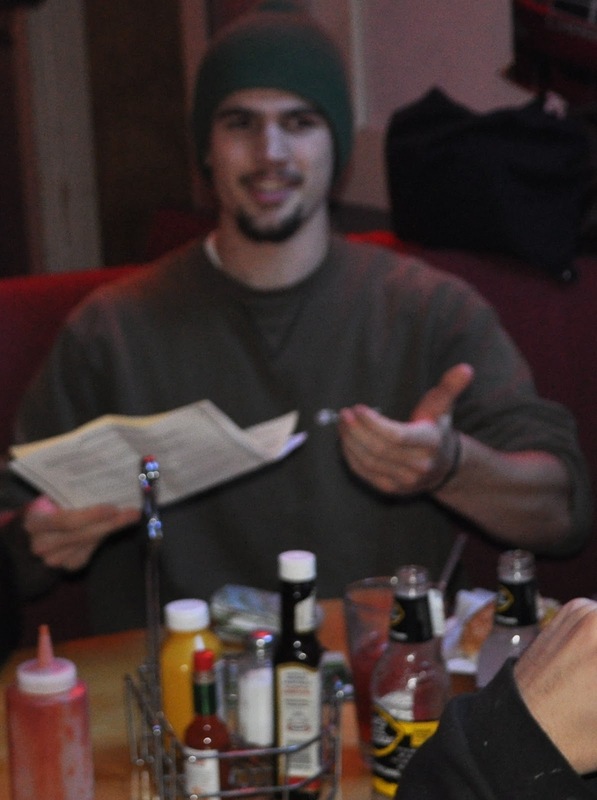 He left the state for a month and a half, and this was his get-together with his friends to tell them about his trip; there were about 20 of them there. Glad to provide more stuff to talk about. About the only thing he said was..."Brruuuce?". Yep, Isaac. You got served. One thing about most regulatory actions is that it's handy to see what information they have on you. 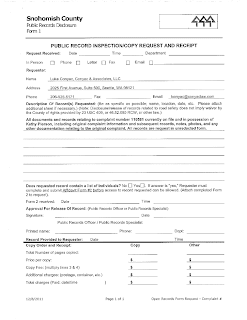 In Washington and many other states, the government has a duty to disclose public records. I've written a short entry about public disclosure, which basically describes what I've done here, and why I did it, and gives you links so that you can do it if you wish. I think that public disclosure is a very valuable tool. Sunshine is good. The file contained about 100 pages. You'll find some of the pictures here, with commentary, and you'll find the working notes here, again with commentary. Enforcement folks really take a dim view of anyone questioning their authority or conclusions. They commonly respond to anything they perceive as resistance by trying to make the matter bigger. In this case Kathy Pierson of the Snohomish Health Department called every single agency she could in the hope that she would be able to get them interested in enforcing something else, and spent weeks on this effort. I fully believe that fruit and vegetables fed to pigs are not regulated by the health district, any more than an apple fed to a horse. They disagree. And they're doing their level best to make sure that I change my mind to agree with them. In general, enforcement agents DO NOT like it when you don't agree with their interpretation of the law. Anything but complete compliance to whatever it is that they deem important is considered to be resistance, and resistance is to be stamped out at any cost. 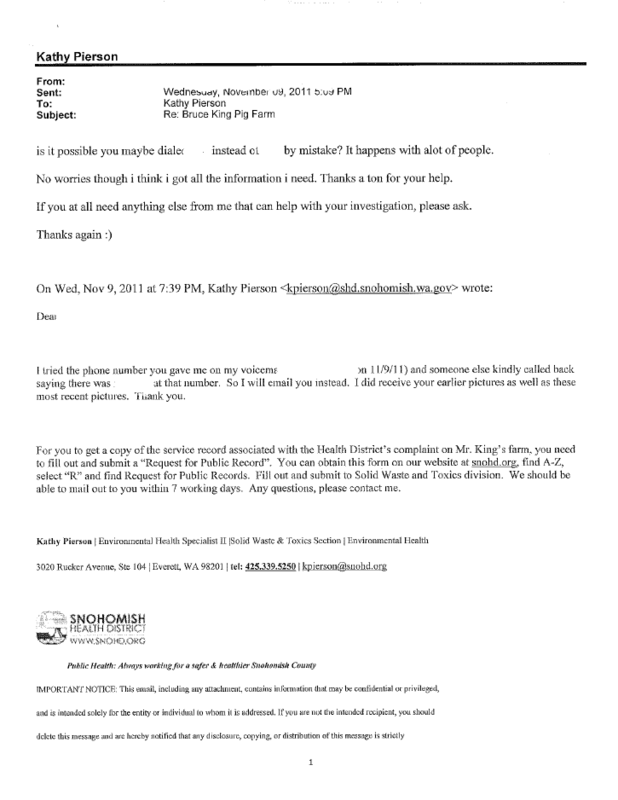 So in the document above, Kathy contacts every single other agency she can think of that might have some interest in enforcing anything. 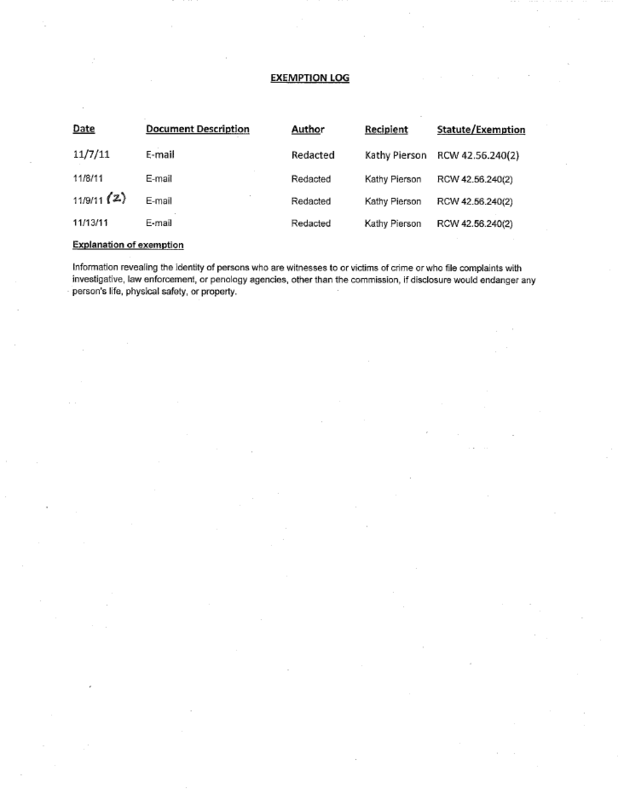 She calls the Snohomish County Planning and Development services enforcement officer for my area, who apparently can't think of anything he can charge me with or enforce. She calls the Snohomish county animal control, who says that while animals occasionally get loose there's no issues of neglect or cruelty, and that they've been observing me for 3 years. This has to be a little frustrating for Kathy at this point. She'd like to find SOMEONE to do more enforcement of me. So she comes out on 7-21-2011 to find that I'm... still feeding my pigs fruits and vegetables. This annoys her to no end, I think. She notes that the goats like the produce, too. 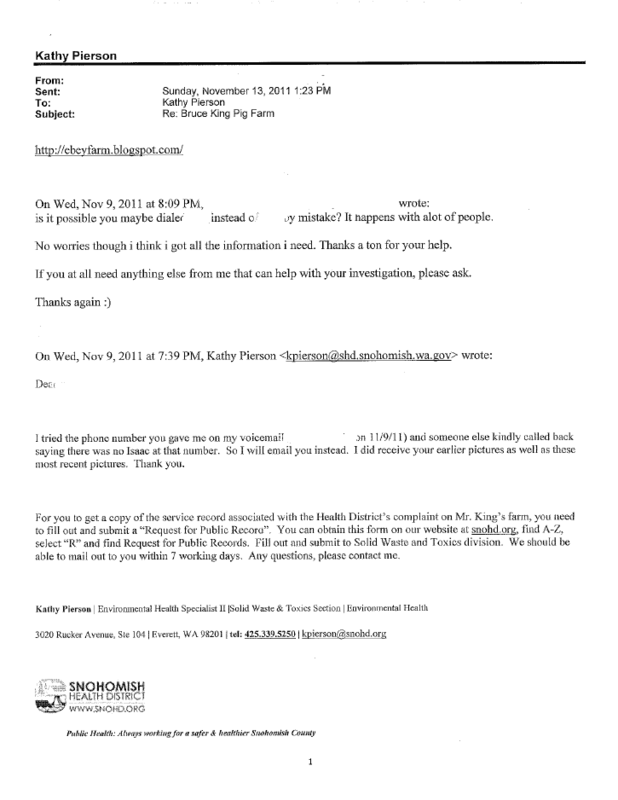 So she calls the snohomish county water quality hotline and reports me to them, talks to three people doing so. Unfortunately I'm more than 500 feet from the water, so that doesn't pan out. So kathy calls the surface water management department, apparently hoping that I'm violating something there. No dice. I'm guessing at this point she's wracking her brain. What other agency can she call? She has done her level best to involve every other agency she can possibly involve. Unfortunately, they either don't have a dog in this fight, or they've already decided that I'm fully compliant OR they've regulated me to the maximum extent possible. The ecogeek reference at the top of the page is for this article, which talks about the difficulties companies are having finding local producers of meat. You'll find the article here. 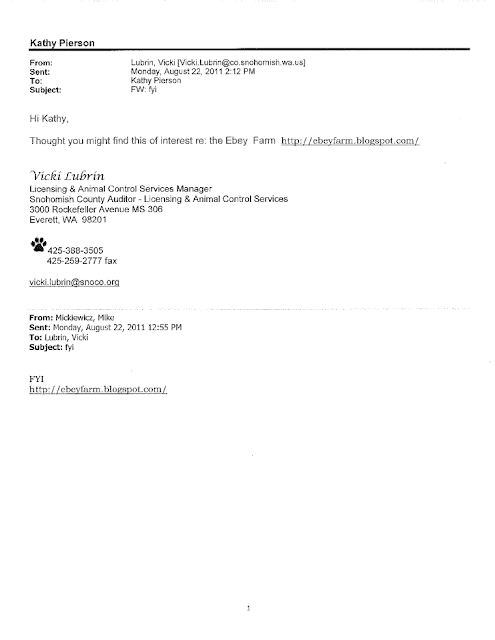 Kathy, if you want to know why local meat producers are scarce, look in the mirror. Current status: They'll postpone any action for 6 months in contemplation of a farm plan. 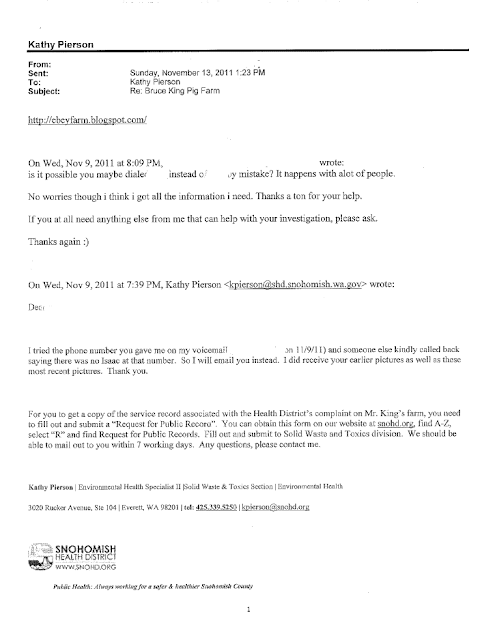 Kathy Pierson contacted every agency that should could think of that might have an interest. One of the agencies, the Snohomish County Animal control refers her to my blog. Glad to see they're readers! 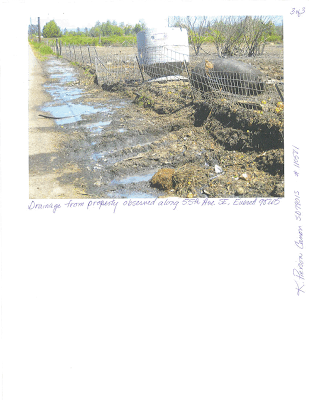 The complainant sends more pictures. And then creates a photobucket page with the pictures on it. Coincidentally, all of those pictures showed up on Isaac Doziers facebook page. Wonder how that happened? They're having trouble communicating. But it's nice to know that he's trying hard to be helpful. It's funny. Here's Kathy telling the fellow how to get a copy of the file. NO problem - here ya go! In Washington State we have a pretty comprehensive public disclosure law that allows you to ask for and recieve public documents. A complaint about your farm (or my farm!) 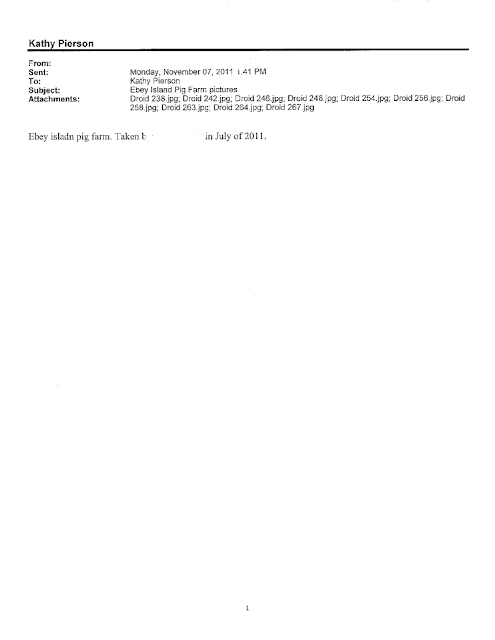 is a public document, but so are the files, documents,pictures, emails and other materials that have been collected. You can get these materials at any time. 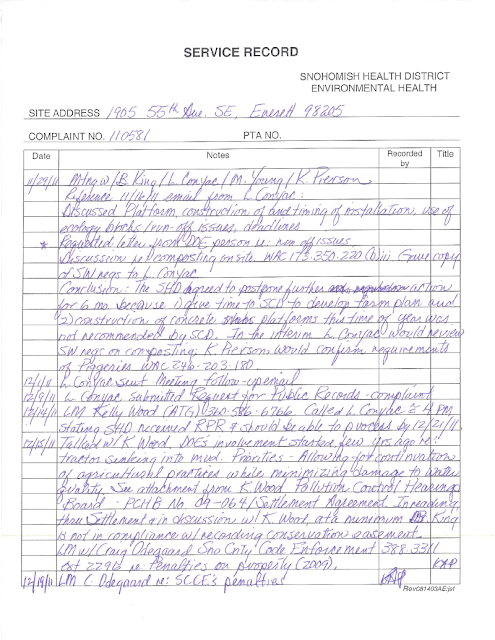 In this case I asked for, and recieved, these materials during the the health departments active investigation. 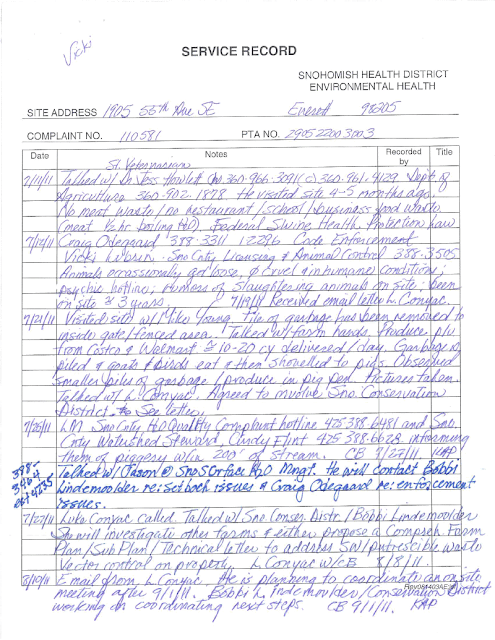 They do reserve the right to redact (edit) some of the materials, but they typically tell you why the did so. 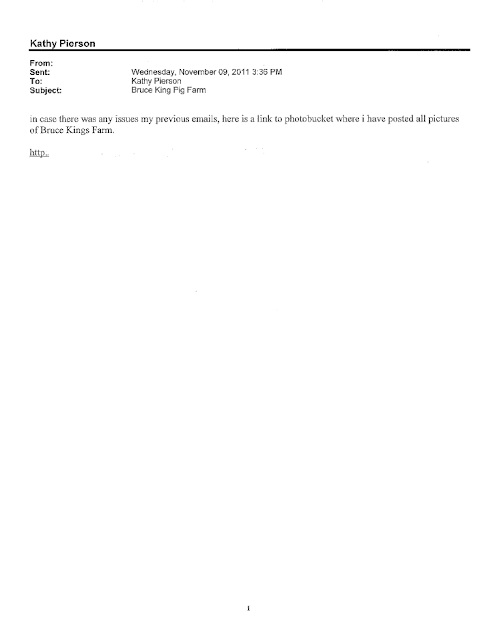 In this case they removed the email address of the person who made the complaint, but left the contents of the complaints themselves. My guess is that the person who complained called in, and then followed up that phone call with email. 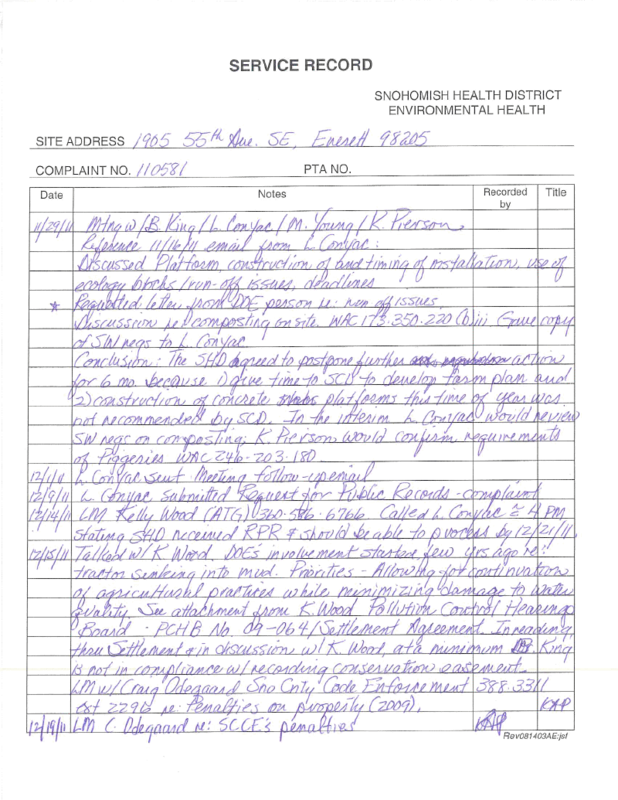 If you have been afflicted with a zoning, health department, Department of ecology or other agency request and would like to see what they're looking at, I reccomend a public disclosure request. At a minimum cost (in this case, I think I paid $15, copying costs) it provides you with information that you may find useful. Each agency usually has a public disclosure officer whos job it is to process these requests. Each agency will vary a little in how they want you to submit your request (use our form, send it via email, write a letter, that sort of thing), but it's easy, and cheap, and I've found that having this sort of disclosure allows me to make better decisions about how I choose to proceed. 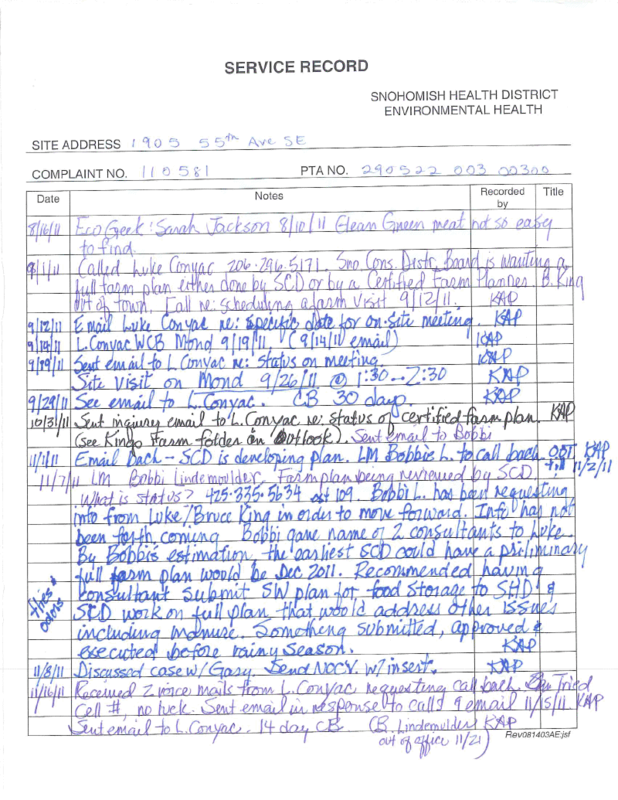 You can also use public disclosure to look at government conduct towards other landowners. For instance -- if your neighbor is allowed to do something that you are being prohibited from, how did they do that? 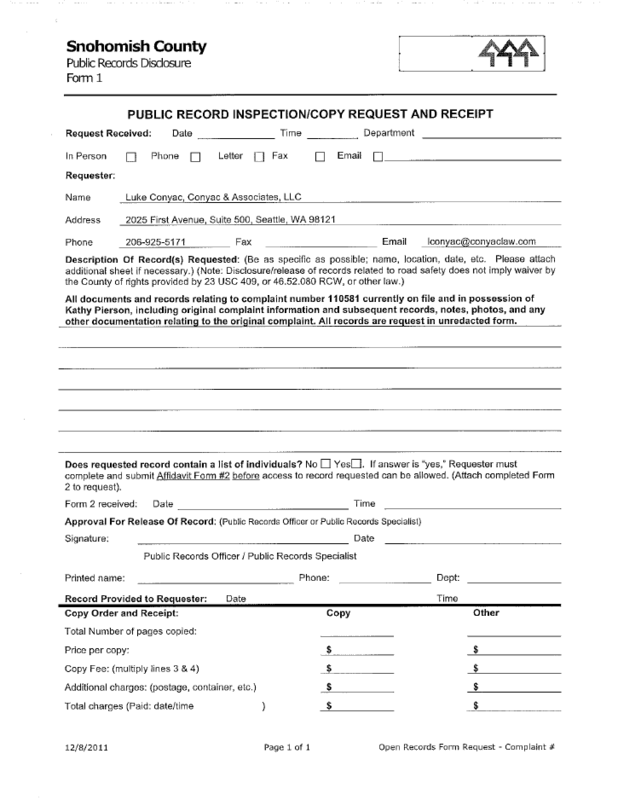 A public records request for their permit, complaint resolution or other documents will give you a roadmap for how it might be done. With that said, if you're going to go into a gunfight, you need a gun. I have found that my results are better when represented by an attorney. I'll start the research myself, so that i have a basic understanding of the issue, and if it looks like it might be serious, I will tend to hire an attorney. You get more respect at the table, unfortunately. Just being a citizen or landowner doesn't really matter to these guys. The fellow in front of the blue tractor is Isaac Dozier. 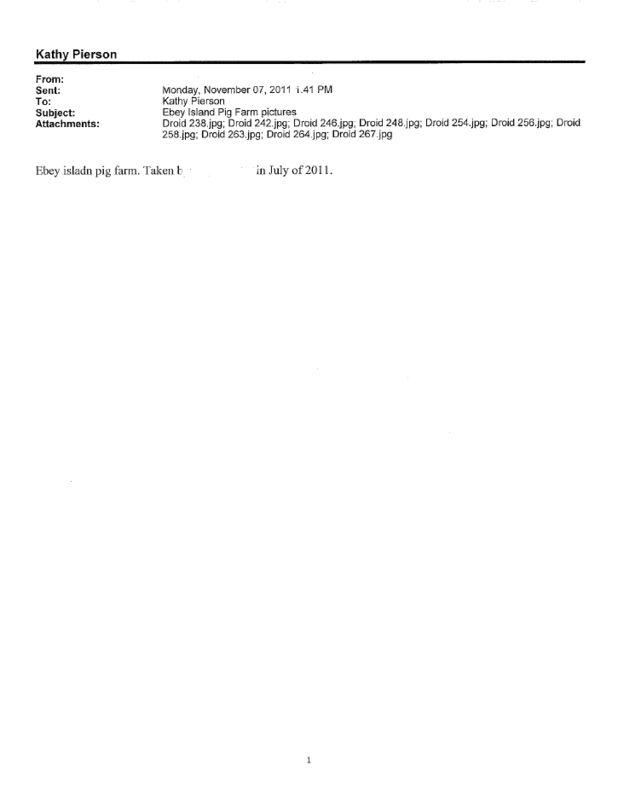 This file contained a number of pictures, two of which I've posted above. So far no surprises there; yep, we feed fruits and vegetables to pigs. 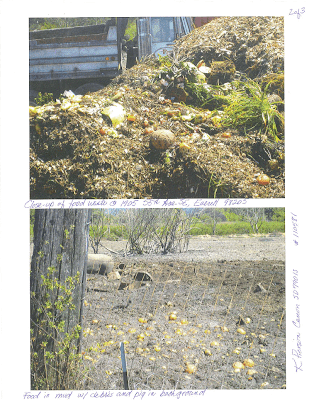 Yep, we dump the material, and then distribute it via tractor to various groups of pigs around the farm. 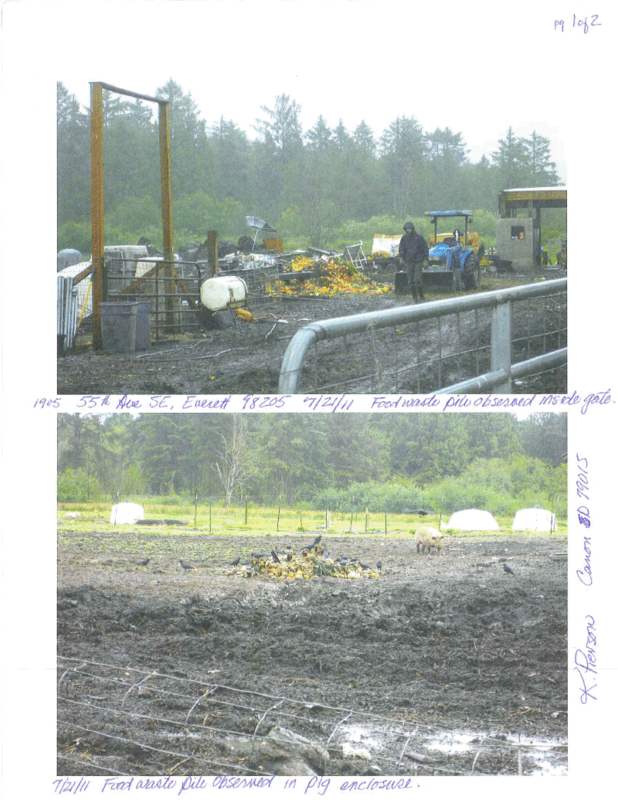 Yep, the uneaten portion is mixed with more wood chips and windrowed, eventually composting. 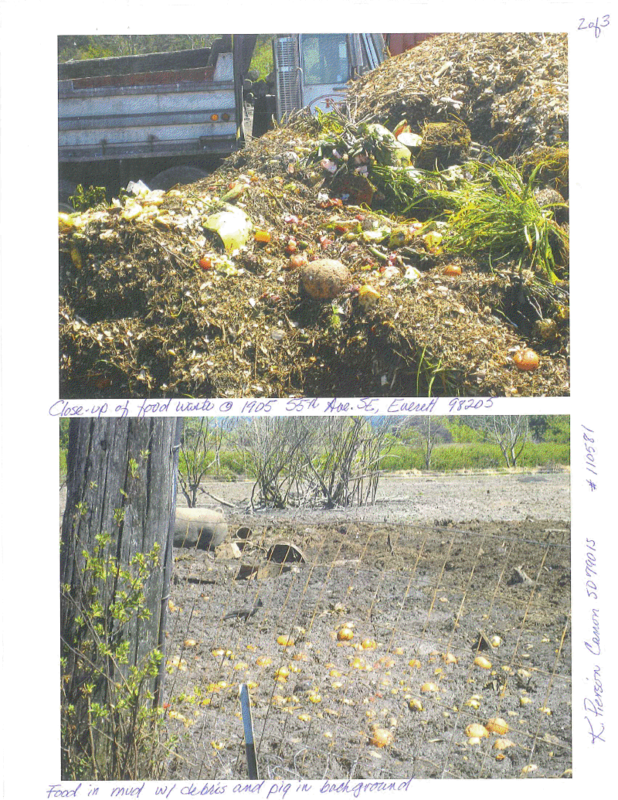 We get a few tons a day, on average, so on any given day you'll find some fruit or vegetables in each stage: Just delivered, fed to pigs, post-pig, composted. One thing that the pictures do is to give you an idea of what they're looking at. The hand-written notes also help. This is an interesting picture. The county road, to the left side, is impervious. When it rains the water runs off it. When the county did the road they didn't raise it above the area around it, nor did they install a ditch to contain the runoff from the road. So when the health department comes over and takes this picture, road runoff is assumed to have come from my property. My experience has been that if you ask one of these enforcement people about what they're after, they're often very coy about it. It's a double-secret violation -- why, if they told you, you might correct the violation. I can't say what they're thinking, but I've been left with that impression repeatedly. 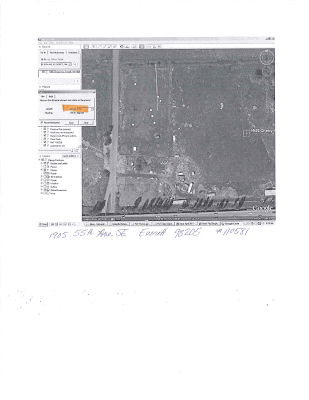 Here the health department is looking at google maps, but notice that they're looking at a line that is 200' from the front of the property. The statute that they cited me with says that I have to be 200' from any water, so I think they're doing the math and found out that I'm more than 500' from any water. They have been very rigorous in their examination of my farm. I'm curious if they consider grazing animals a violation. I'll have to ask them. No stone left unturned. Farm pricing - what's fair for a pig in 2011? I was watching one of those reality shows; the one I was watching was a fellow who goes into failing restaurants, looks at their operations and rehabs them for $10,000. So he's needling a woman about her handling of the restaurant, and ends up asking her a question that I thought was interesting. "How do you price your food?" he asks. She replies she doesn't really know. "Well, with most places they take the cost of the food, and then triple it, and that's the cost of the finished dish. So in the case of these crab cakes, your food cost is $6.80. So a retail price for that dish is $20.40". Oh, ok, she says. "but you are charging them $18 for that dish, so you're losing $2 per dish. How long can you do that?" As I watched this unfold, I realized it had a strong echo in how I see a lot of the small farms around here price. They sell their production at a price that I cannot understand. So here's a little writeup on pork costs, using the ratio they described. Feed is $440 a ton right now -- darned high. It takes 800lbs or so of feed to bring a pig from wean to market weight. That's $176. The weaner pig itself sells for about $80 around here. Adding the two together ($176+$80), you get $256. Then multiple by three gives you $768. If we were a restaurant, we'd need to charge $768 for the pig, and we'd expect the customer to pay 10 to 15% more than that to the guy who handled the order- their tip. Wow. What Would I have to do to get the customer to tip my farmhands? Well, you're probably thinking that the restaurant has to pay rent, and has labor costs, and has to buy dishes, and advertise and... wait a second. My farm has rent, labor costs, tools and materials. $2.25/lb hanging weight, or roughly $450 for a full-sized pig. Add to that the kill fee for the farm kill, at $55, and the likely cut and wrap costs (200lbs at $0.65/lb, $130) and you end up with a consumer cost of... $635, and we are STILL under the standard markup for your average restaurant. Farming is a business, and like any other, the basic way it works is to sell things for more than it costs you to produce. Examining your business by the standards in other businesses is good. And this exercise leaves me feeling like we're undercharging. Lest you think that restaurants are particularly high priced; most items at retail are marked up 50% over their cost to the retailer. About done with the slab base. The picture below shows the progression. On the left at the edge is the 2" rock, and then there's a layer of 5/8" minus rock in the center, forming a 2" raised area, to reduce the amount of concrete needed for this slab. and here's the finished surface. I took this picture after dark because it's a lot easier to check the level after dark -- you can see the laser level better. This surface is plus or minus .25", so we're good. A couple of simple forms, and we're ready to pour. 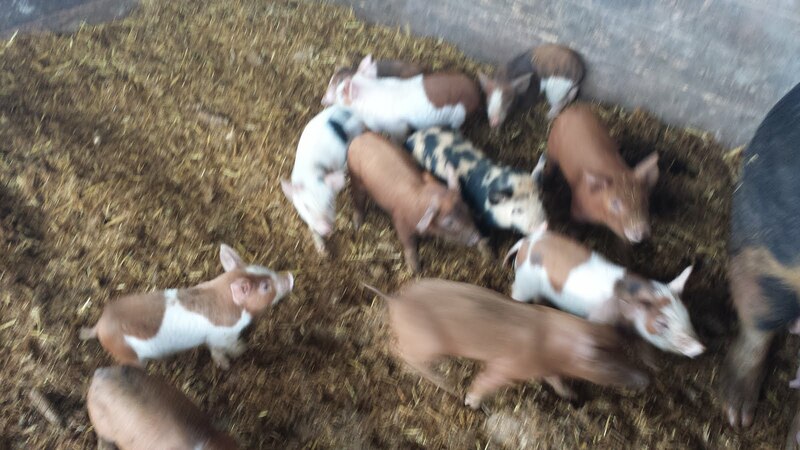 Oh - THATS where the piglets are! I'm working on the chores, and about lunch time I stop and go to close up the gate so I can go run some errands and eat lunch. A sow and her piglets had been hanging out close to me while I worked, and as a matter of habit I looked for her, and counted her piglets, and came up 3 short. Our fences are good at keeping full sized pigs in, but piglets are a different matter. They can fit through pretty small holes, but I don't worry about them too much because they mostly stick close to their mother and they don't cause any problems. Kinda fun to watch them run around. But where are the 3 missing piglets? So I'm looking everywhere, and I see something odd on top of the pile of wood chips. I can't quite make out... it's a piglet! Ok. (so click on the first picture, and you can see the piglets ears sticking up just a little to the right of center, at the top of the pile. And I get closer, and sure enough, there's a piglet, snoozing on top of this 15' pile of wood chips. In fact, all three missing piglets are napping up there. They're taking advantage of the heat coming off the pile; quite a bit of heat, as a matter of fact. They're napping in the warm updraft. So I stop, and think about it, and then go about my errands and lunch. Enjoy your warm nap, piglets. One of the readers here called and asked if I'd like 90 gallons of soy milk. Sure, I'm always up for good quality food for the pigs; what's wrong with it? Getting close to expiration date is fine. We'll be right over. Of course there's a small catch. It's packaged in cases, about a quart per container, 12 containers per case. But we've developed a system for this. First, slice the top of the case off. Yes, it says no cut on it, but we're experts. Professionals. We can do this stuff. Then cut a slit into the top of each row of boxes. Make that 4 slits. Pour the whole case into a handy container. Here we use the 30 gallon garbage cans; that's our single-serving size, pig style. It really makes a nice foam when it's poured like this. Smells good, too. Yummy vanilla flavor. lets see. There are 240 calories per box, 12 boxes per case... that's roughly 3,000 calories per case. We have a hundred cases.... yep, Score! Thank you! Lovely foam. Let's see what they put into this stuff. Pure, natural, organic. Nothing but the best for the piggies. I should have taken pictures of the pigs drinking this. I did, but my camera malfunctioned. But thank you, and it was appreciated. Every pig got a 2,000 calorie soy milk boost today. Pig prices are seasonal; winter piglets are cheaper than summer. I look at prices every now and then to see what the market is. Prices this year are generally higher than they've been in the past years. As with most years, there are some producers that don't want to raise a pig in the winter, and they're selling the pigs cheap; happens every year. I sell a lot of finished pigs in the spring because there's not much local supply. My price for my weaners is $80; this isn't the lowest price, nor is it the highest. For breeding stock I'll charge a significant premium; what folks are buying is the hand-selection and special care of the pigs. Some of the ads talk about show pigs, fair pigs, ffa pigs or 4h pigs. Most of those ads are from folks who are looking to sell pigs in a few months. Those ads are also listing the highest prices. Right now is about the lowest weaner pig prices of the year. The highest prices are usually March-May, and my guess this year is that we'll see $125 to $150 a pig average price this season. There's not as much production locally, mostly because of feed prices. Most pig farmers that I know of reduced their herds to a bare minimum when the feed prices spiked, and feed prices haven't gone done. For those of you raising pigs, remember that people eat pork all year, and Easter hams are popular. Stay the course, watch your costs, and charge an appropriate amount to make a fair profit. For my own operation I'm selling a steady stream of finished pigs and a few piglets, but the majority of my production is being finished for sale in early 2012. Kat has had a nice litter of pups that will be weaned just in time for Solstice. She's a little camera shy, but soon warms up. Cup in the picture for reference. There are 10 pups, 6 boys and 4 girls. eyes are open and they're eating food. A whole pile of puppies. Soon to be under a tree near you! Farmers note: Going to garden this year?